"In general... It is fruitless to try to determine "the meaning" of a specific coat of arms. Coats of arms were, for the most part, freely adopted by individuals at some point in the Middle Ages or later. In almost all cases, it is impossible to say what meaning, if any, they saw in the arms they adopted. Even in the case of grants of arms, it is usually not known who designed the arms (the recipient or the royal herald) and what he had in mind. Do the Lost Tribes have a Right to Use Heraldic Arms? The bars and mullets became the stars and stripes of the American Flag. The white shield with two horizonal red bars and three red stars each with a hole in the center. 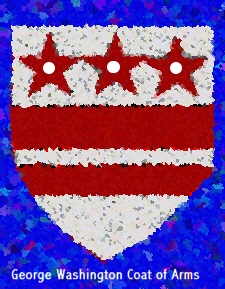 The holes were represented in the original Washington shield. "The stars and stripes correctly called bars and mullets, heraldically joined the crusader cross of the Lawrence family when Edmund Lawrence married Agnes de Wessington, in 1390. In 1540 the Lawrence's came to Steeple, whilst a descendant of the Washington's settled in Virginia and became the great grandfather of George Washington, the first President of the USA. The coat of arms appears above the north door at Steeple church, on a stone shield in the south porch, and is repeated four times inside the building, on the barrel-vaulted roof panels." The meaning of symbolic colors and images on the Washington shield, [using the descriptions listed below]. "Jews in Europe used heraldry, like everyone else. Indeed, it is a striking counter-example to the misconception that heraldry was ever the preserve of the nobility or the knights, that Jews have been using coats of arms as far back as the 14th century, not only privately but also in their official dealings with Gentiles (e.g., seals on legal documents). " "The regulation of English heraldry between 1530 and 1688 has led many writers to project back into the Middle Ages concepts and beliefs of later times. In particular, one often sees the claim made that, in Medieval England, arms were restricted to the knightly class, or at least to the gentry. Furthermore, by equating gentry with nobility, some reach the conclusion that arms were restricted to the nobility. One aim of this essay is to debunk these notions. Prior to the 16th century, heraldry was unregulated in England, just as it was unregulated in all European countries. No laws or institutions prevented anyone from adopting arms as they pleased. Heraldry spread from the noble and knightly class to the merchant, craftsmen and farming classes from the 14th century on. " "Heraldry is known to have existed in Ireland by the 13th century, imported by the English conquerors. Some traditional Celtic symbols have been incorporated in the arms of some families. " No state shall...grant any title of nobility. Gold means noble - the Sun. originally only princes could wear it. Acorn = Antiquity and strength. Alisaunder = (Similar to laurel) Peace and/or triumph. Allerion = (Mythical creature, similar to an eagle, but without beak or claws) Strength of will and authority of mind. Bat = Awareness of the powers of darkness and chaos. Bezant/Byzantine Coin = (Also Besant; Gold Roundle) Worthy of trust of treasure. Billet/Billettee Bricks or letters = (correspondence); one who obtained credence, knowledge, and faith in his words and deeds; one who is secret in one's affairs. Birdbolt = Small arrow with blunt head. Bonacon = Bull with horse's tail and short mane. Buglass = (purple quatrefoil) Hope and joy. Cadences = (Marks of Cadences) Used to differentiate the heirs in a family. Candle = (Lamp) Light, life, and spirituality. Drops = (Guttees) One who has endured torrents of liquids, as in battle, depending upon the color of the liquid. Eagle = Person of noble nature, strength, bravery, and alertness; or one who is high-spirited, ingenious, quick-witted, and judicious; "True magnanimity and strength of mind" acc. to Guillim. Inescutcheon = "Escutcheon of Pretence"
Jessant de lis = With a fleur-de-lis shooting out, i.e., from the mouth of a leopard or lion; Represents dominion over France. Maunch = (lady's sleeve) "For my lady's sake"
Pike = (Fish) A true, generous mind; virtuous for himself, not because of his heritage; also unity with Christ, spiritual nourishment. Shamrock = Perpetuity; floral device of Ireland; also Trefoil.